New Apple AirPod patents reveal more health-tracking capabilities | What Hi-Fi? Apple's move into fitness tracking could include measuring your heart's electrical activity, and the amount of blood pumping through your body. An apple a day keeps the doctor away, right? Well, new patents for Apple's next iteration of AirPod headphones could do just that. Patently Apple has spotted plans to add EKG sensors, impedance cardiography sensors, and more health-related technology into the company's wireless headphones. EKG sensors monitor the electrical activity of your heart, while impedance cardiography measures the amount of blood your heart pumps, and how often its pumping, to work out the total amount of blood going around your body. The patent also notes that "the housing of the earbud can be symmetric, so that the earbud can be worn interchangeably in either a left or a right ear of a user". This hints at a possible new design for the AirPods, and signal a move away from Apple's classic headphone style. We've been expecting Apple to bring out biometric headphones since an earlier patent was discovered in March. And it's not a unique technology - products such as the Bose SoundSport Pulse - our best in-ear wireless headphones - give a live reading of current heart-rate, with the information being sent to popular third-party apps including Strava, Endomondo and MapMyRun. 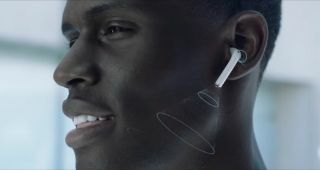 Whether the data gathered by these future AirPods will be locked to Apple's Health app or available to other applications is as yet unknown. But if you were thinking of picking up a pair of AirPods, it might be worth holding fire until the next generation makes its debut. Jay-Z's new album to come to Apple Music after just one week's Tidal exclusivity?